Running your own business is one of the terrifying tasks to do, but it is not impossible. Many people start with small start-ups Instead of big companies, there is a greater risk. In big corporations more money, people, effort and time is involved, however, small start-ups also do not ensure success entirely. This is the thing about business, you are bound to make mistakes and you have to face few repercussions at one point, as well. Failure is evitable and everybody goes through different failures, through different phases of life. If you pick up biographies of most successful businessmen you will earn that each of them stumbled and even fall few times, but their persistence and determination is what made them successful. You have to accept that the mistakes that you make today are temporary setbacks. There are lessons by each mistake and these lessons will assist you in accomplish your goals. 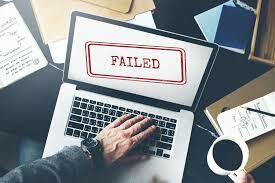 If you are someone who’s business has failed or you are so scared of failure, that you have been holding back starting your own business then you should scroll down. Read how you can prevail in times of failure and stay motivated throughout this course. Learn why motivation is so important for being successful! Whether you are running a home-based business or multinational corporation, if not you some other person is going to make a decision which can cause take a toll on your business. Launching and running your own start-up is not an easy chore and there are many minor details to focus on. These specifics are so overwhelming, that you are bound to skip few which will ultimately become the reason for your failure. Nevertheless, these failures are a lesson in themselves. Of course, it is natural to get disheartened when things do not go in the way you have planned, however you have to accept this fact that failure is unavoidable. Your failure is not something out of ordinary, all people go through with it, and what you do after failure is what counts. Only when you have accepted this fact, the small failures will appear as minor holdups. You will learn to take these hindrances in your stride and focus on your end goal. When you starting a new business numerous people and things are involved. You have to go through hundred details and tasks every day to ensure everything goes smoothly. There is also an immense pressure to make all this work, this pressure can result in an error. A single error can dissolve your entire operation. In such instances, it is very easy to blame someone for your failure, even so, the right thing is to accept that you have made the mistake and blaming others will not make it right. In the end, it is your company and you are the one who is responsible for every aspect and process. You have to learn to accept and take responsibility of your mistakes and the failure of your organization. Learn and embrace your mistakes, once you will learn it you are never going to repeat it again. This is what going to make you successful in the future. Failed business can push you to the depths of depression. Nevertheless, bottling up emotions and going in isolation is not the solution to your problem. Grieving is a natural process and you should take as much time as you need. You don’t have to start fresh the very next day. When you have not dealt with your failure the emotional baggage will hinder in your thought process and affect your decision-making skills. The best thing you can do is let your grief out to start afresh. In a tough time like this, it is important that you have your friends and family beside you. Talking about it helps to get the burden off your chest. Also, while you talking it through you might see your mistakes from the perspective of others, through which you will learn a lot. By sharing you will realize what you could have done instead and these are the points that will assist you in the future. Remember the failure is harsh but not permanent. Instead of focusing on your failure, focus on what you are achieving. While you might be failing at your business, but there are plenty of other things that you excel at. When you are focusing on failure, you are spending all your energy getting exhausted and irritable. This negative attitude will influence all your decisions and behavior in which you are dealing with people. The negative impression on other people will push them away and it will be more difficult for you to accomplish your goal. When you are focusing on smaller achievements your mood will lift automatically and you will become more emotionally stable. This emotional stability will give you more clarity in decision making. Positivity will make you more relaxed and friendlier with people around you. Do not get stuck on one failure. By dwelling on past, you will miss out all the future opportunities. We have already learned that failure is inescapable, by thinking about what you could have done right you can think now what you can do right. No matter how much you look back on past and think about it you cannot change it so why to waste your energy and time looking back. Instead, you can invest your energy on the tasks ahead. Yes, you did fail but it is a tie for you to get up, dust off your hands and get back to work. It is very important to get organized when you are turning a fresh leaf. As we know the devil is in the details. You might not be able to avoid failure altogether but you can minimize its chances by perfecting details. Get everything in order, keep in mind all the mistakes you have made before and learn what you could have done better. Plan your every move, write all your tasks and deadline and work on them accordingly. Creating a plan define where you are going and how you will go. This will help you and your team to complete tasks effectively before deadlines. Organizing is life-saving skill and you should start practicing in your everyday life as well. You have to believe that visualizing is essential for success. Once you start visualizing, your imagination will guide you step by step. By visualizing you will get an idea of things and they become more achievable. This visualizing creates a positive mindset which will create and send positive vibes to everyone working around you, which will also encourage them to work as hard as you. Try to surround yourself with people who have a positive vibe and encourage you to do better which will, in turn, your perspective sunny. What I have learned so far that failure is painful but there is no way around it. At one point you have to deal with your grief and move forward. This positive vibes and lessons learned from mistakes after failing will mold your future endeavors to success. To move onward you have to admit and accept your mistakes. Cope with the failures with the tips mentioned above. The persistence and determination are vital to achieving your ultimate goal. These tips have helped me to get motivated and I know it will do the same for you. If you have any more motivational tips which have helped you to go through rough times, share it in the comments below.